Megan holds a PhD in zoology from Washington State University and has worked for seven years in the field of environmental education. She brings a passion for science and the outdoors and hopes to bring real inquiry based science to students across the US. 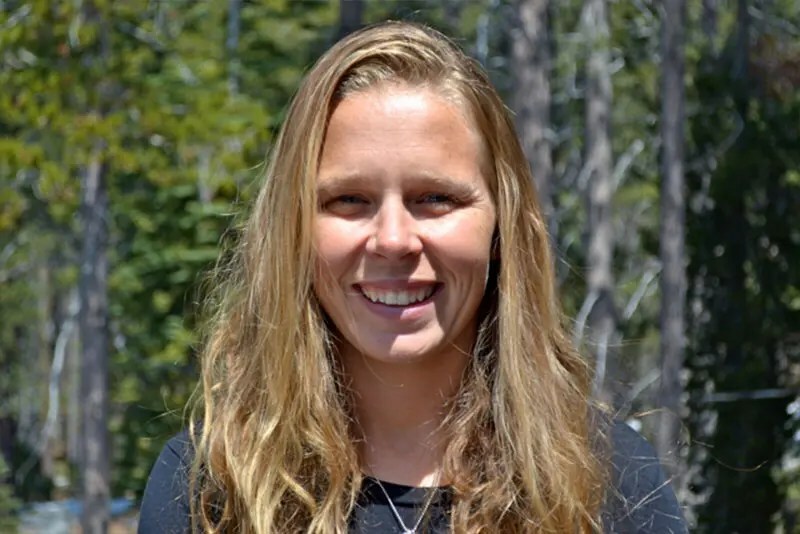 In her free time Megan enjoys Nordic skiing, running, and playing with her family in the Sierra. Spencer graduated from Bowdoin College in 2012 with a BA in Biology with a coordinate major in Environmental Studies. His thesis helped demonstrate the ability of a terrestrial scanning laser to quantify leaf photoprotective mechanisms and made a case that this technique can be scaled to three dimensions. This will be his fourth year of working in outdoor education. Mary Ellen holds a BA in Biology/Environmental Studies from University of California, Santa Cruz. She has worked as an environmental education guide for seven years balancing that with substitute teaching K-12 in the local school district. For fun she coaches a high school Nordic ski team and tries to get in as much play time outside, skiing, running and biking. She hopes to inspire students to be curious about natural processes in order to foster a deeper appreciation of our environment. Michelle has been a licensed architect in the state of California for over 32 years. She brings her passion for both the natural and built environments. She believes that in an ever-increasing technology based world, environmental education, awareness, and interaction is vital for survival and sustainability. She has been self employed for the past 32 years, is a member of the American Institute of Architects, and has volunteered countless hours at her local schools. She hopes to bring collaboration, ethics, and creativity into our processes, problem solving, and development. Michelle loves swimming, cross country skiing, hiking, kayaking, and just enjoying the beauty of our natural environment. She graduated from the University of California in Environmental Design with an emphasis in Architecture. Andy is the Dean of Students and a science teacher at the Sugar Bowl Academy where he has worked for 10 years. His focus in the classroom is to continually push core understandings in science by drawing together the big ideas in science. He asks students to develop the ability to make observations, ask scientific questions, formulate hypotheses, design experiments and create a scientific argument. His goal is not only to improve students’ scientific mind, but also to build confidence and independence. He has extensive experience training adults in student support programs and outdoor education. His experience as an educator, residential life specialist, scientist and outdoorsman makes him a great member of the HSI Advisory Committee. Andy is a member of the National Association of Biology Teachers and the Nation Science Teachers Association. Craig is a career communicator, having held a variety of roles involving public outreach, academic communications, corporate marketing, fundraising, and writing. Most notably, he was the Director of Communications for several years at The North Carolina School of Science and Mathematics, one of the nation’s premier high schools, and one of four founding members of The National Consortium of Secondary STEM Schools. Craig has been a full-time contract writer for seven years, works as a wilderness guide and is a strong proponent of experiential education and all forms of hands-on education. He has a Bachelor of Arts in English and Professional Communication from Nazareth College. Erica is a Washington, DC-based consultant and advisor to National Education Association, elected leaders, and 501c3/4 organizations.